aka "Why The Ireland Post Still Isn't Done"
This morning most of the seven students were ready to start the actual weaving - much to our amazement since we're all fairly new weavers and this was a pretty complicated pattern. The purpose of the class was to see what the five threadings looked like with different treadlings (the order in which the four harnesses are raised) and with different color combinations. With five threadings, 12 treadlings and three different colors, you can imagine how many pattern/color variations we ended up with. I came home from class tonight with seven patterns completed. 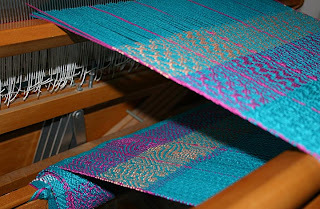 The loom is set up in my studio and I'm planning to weave into the night. 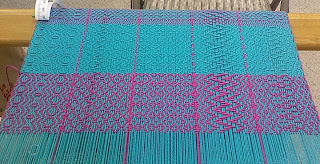 I want to have this 4-yard sampler woven and ready for Guild show-and-tell on Saturday - and I think I can actually accomplish that goal. 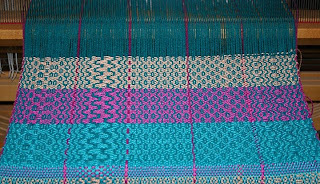 Can't wait to see what this looks like off the loom.